Republican Kay Bailey Hutchison said Tuesday she will not seek re-election after her current Senate term and is weighing other options, which could include a bid for Texas governor. "I was honest in the (2006) campaign that it was my intention to not go beyond this last term, third term," said Hutchison of Texas. "I know every other option is certainly available, but I don't intend to run for a fourth term." 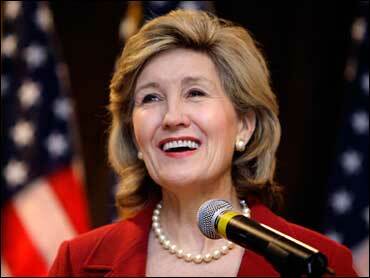 She said running for Texas governor in 2010 is one option but she has not made a decision. Hutchison was a little exasperated Tuesday with the attention to her plans. The renewed interest was triggered by her comments to Texas Monthly magazine. Excerpts of the interview were posted Monday on the magazine's "State of Mine" feature written by editor Evan Smith. The full interview is to be published in December. Hutchison told Texas Monthly magazine that stepping down in two years "has to be considered." "I will be looking at what is best for Texas. If giving someone a lead on seniority is an option, if I ran for governor, I would try to do that in a way that was most advantageous to a person who would be coming in and representing Texas," Hutchison told reporters outside the U.S. Senate. Hutchison denied she has made herself a lame duck by saying she won't seek re-election years before her term ends or she resigns. "There's just too much talk about it right now because it's so far away and I think anyone in politics who talks about something three years out is probably not very experienced in politics," Hutchison said. Hutchison had considered challenging Gov. Rick Perry, also a Republican, in 2006. But she backed out of what was likely to be a bruising and divisive race. "It was not the right time for Texas and it was probably not the right time for the Republican Party to have that kind of challenge," she told Texas Monthly. But now, "there's not anyone who could really make a case to me that this would be divisive for the Republican Party in a way that would make me step back," she said. When she won a special election for the seat vacated by Lloyd Bentsen in 1993, Hutchison pledged to serve only two terms and declared herself a supporter of term limits. But last year after she gave up the gubernatorial race, she declared she was seeking a third term. Hutchison said she still supports term limits, but wouldn't bind herself unless other senators also left after two terms. She won her first full term in 1994 and was re-elected in 2000 and again in 2006. If she does run for governor and wins, once she steps down as senator a temporary appointment would be made by the governor to fill the Senate seat until an election is held.